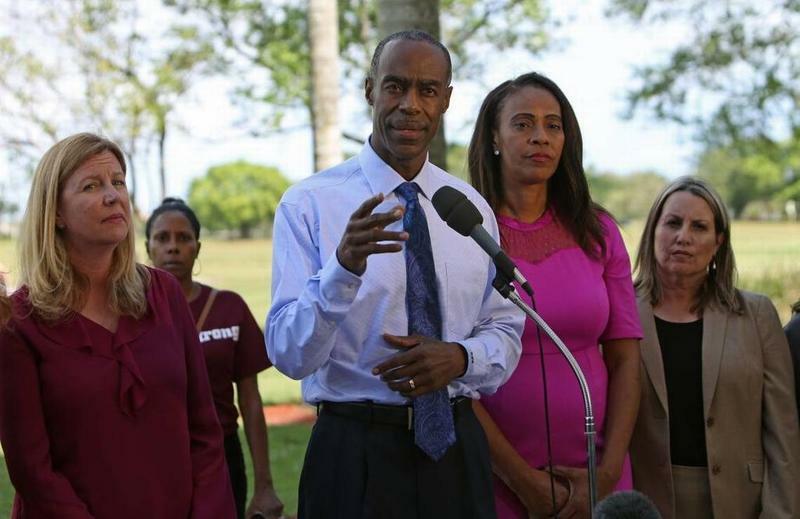 Broward Schools Superintendent Robert Runcie made a press conference stop after his visit to Marjory Stoneman Douglas High School, Wednesday. Throughout Broward, schools were under the protection of a mix of police officers and armed guards — a change compelled by a new state law passed after the Feb. 14 shooting at Marjory Stoneman Douglas High School. The Parkland school was one of the first stops Broward Schools Superintendent Robert Runcie made during his daylong tour. As students filed in for what he called a bittersweet and emotional first day back, Runcie highlighted a series of security enhancements made on campus over the summer. For example, there's now a 12-foot fence around the building where the shooting took place. The security presence has been doubled on campus permanently, including new armed school staff. There are upgraded cameras, new intercoms and classroom doors that lock automatically. One security measure that’s not in place at Stoneman Douglas: a metal detector. 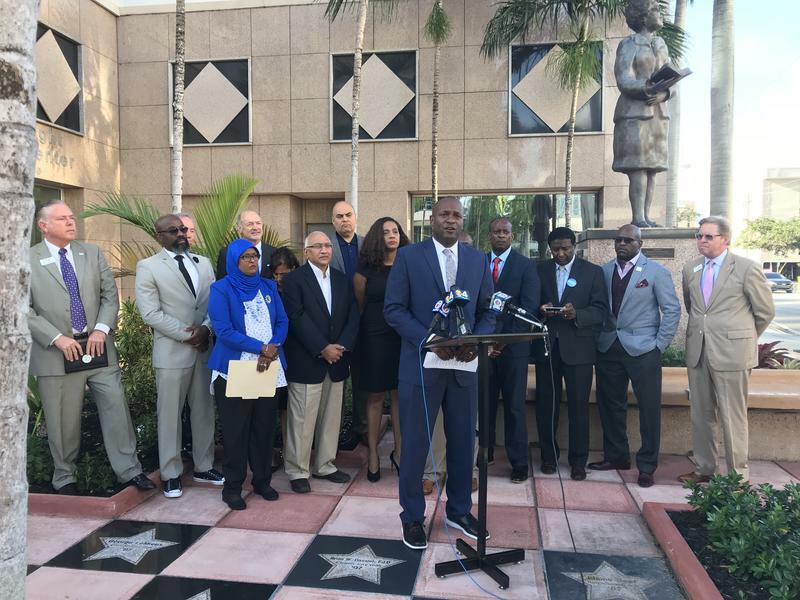 Runcie recently changed course on a plan to install metal detectors at the Parkland high school as part of a pilot program. A nonprofit security consultant on Tuesday recommended against using the devices, arguing they are ineffective without additional costly measures like X-ray machines and staff trained to perform pat-downs. Runcie chose not to answer two questions from reporters about whether there would be metal detectors at the school. His reversal on the issue was one of the criticisms cited by victims’ families in their recent push for new leadership on the school board. Five of nine seats are up for re-election on Aug. 28, and two parents of students who were killed are running. 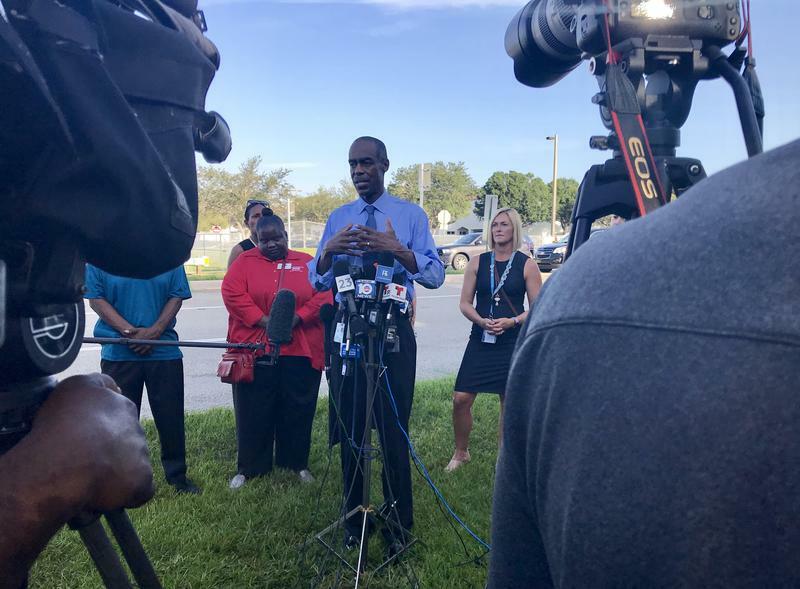 While he met with the press Wednesday, Runcie addressed a question about whether he has been in touch with families of victims, since some have complained about a lack of outreach from the district following the tragedy. He said Wednesday he talks with victims’ families regularly, but those interactions aren’t publicized. “I'm not going to do selfies and social media posts when I meet with families,” Runcie said. Runcie recently appointed April Schentrup — an elementary school principal in the district whose daughter, Carmen, was murdered in the shooting — to a new administrative position overseeing safety and security. Hear more from Runcie's visit with West Hollywood Elementary students. Runcie visits a second grade class at West Hollywood Elementary Wednesday afternoon. Students were also visited by Hollywood Police officers guarding the school. On Wednesday Runcie also visited West Hollywood Elementary. There, city police are helping to meet the state’s new law enforcement requirement. 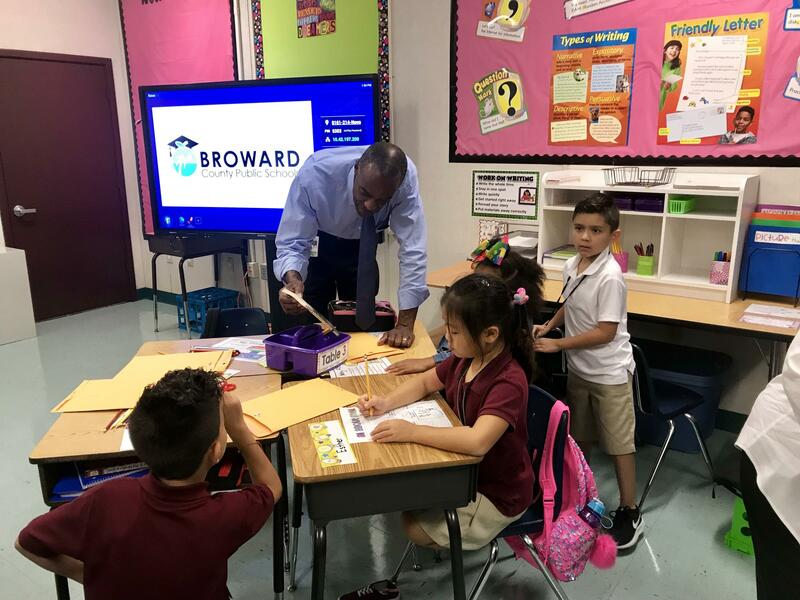 Runcie dropped in just before the last bell rang, visiting several classrooms with Hollywood police officers who wanted to introduce themselves to students. Hollywood's Vice Mayor Debora Case also came to greet the second and fourth graders. "The police are warmly welcomed by the students, and the instructors,” she said. Runcie said he hopes to eventually have one school cop for every 1,000 students — which would be paid for, in part, with a tax increase that will be on the Aug. 28 ballot for voter approval.